Barcelona is bordered on the north by the Collserola Mountains, but is effectively cut off from this connection to nature because of urban development and highways. A new plan is underway to reconnect the city with nature via "Les portes de Collserola," or the Doors, which are inlets from the mountains down into the city. Spanish firm Taller Sau Arquitectura recently received first prize for their entry called e(co)stratègia. Their plan calls for a large nature bridge to be built over a highway to create a new park, garden space, pathways and a pedestrian connection between the city, the mountains and the river. 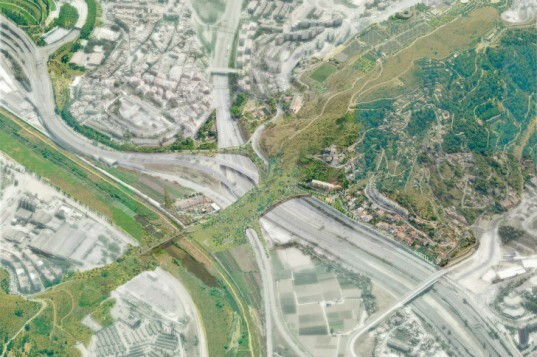 Taller Sau Arquitectura recently received first prize in a design competition to come up with urban interventions to reconnect the Collserola Mountains with the city of Barcelona. The competition was about rethinking the border between the natural park of Collserola and the City of Barcelona. This border was divided into 16 parts called “Les portes de Collserola” and many firms came up with proposals for them that worked with their context, location and needs for the area. Taller Sau’s winning design, named e(co)stratègia, is a proposal for the 13th door adjacent to the neighborhood of La Trinitat is on the north side of the city. The area is one of the main entrances to the city by car and large highway fragments fabric, dividing neighborhoods and green pockets. Their proposal calls for a land bridge that creates a nature connection between the surrounding green spaces, the river, La Trinitat and the city to the south. The space is neither wild nor an manicured urban park, but rather domesticated nature, where one can find community vegetable gardens, open air green spaces, paths, wildflowers and lots of trees. No word yet on when this project could be implemented, but we’re always a fan of reconnecting with nature. 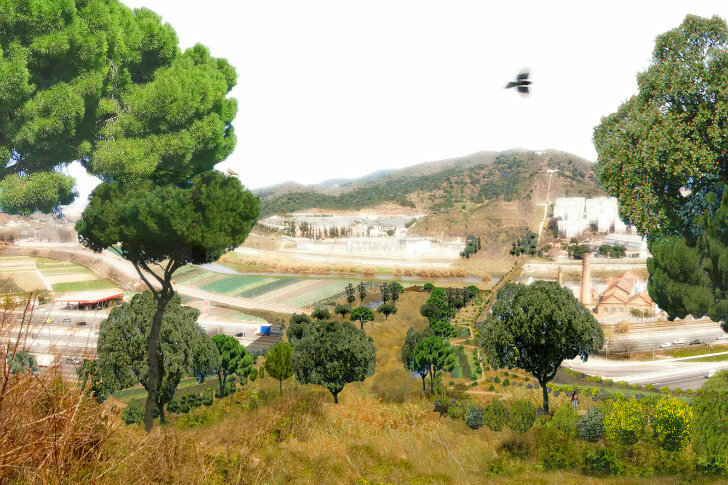 Taller Sau Arquitectura recently received first prize in a design competition to come up with urban interventions to reconnect the Collserola Mountains with the city of Barcelona. The competition was about rethinking the border between the natural park of Collserola and the City of Barcelona. This border was divided into 16 parts called "Les portes de Collserola" and many firms came up with proposals for them that worked with their context, location and needs for the area. Taller Sau's winning design, named e(co)stratègia, is a proposal for the 13th door adjacent to the neighborhood of La Trinitat is on the north side of the city. The area is one of the main entrances to the city by car and large highway fragments fabric, dividing neighborhoods and green pockets. The bridge would cross over the highway and maintain the important transportation corridor for cars and trains. Their proposal calls for a land bridge that creates a nature connection between the surrounding green spaces, the river, La Trinitat and the city to the south. The space is neither wild nor an manicured urban park, but rather domesticated nature, where one can find community vegetable gardens, open air green spaces, paths, wildflowers and lots of trees. Plants that could be included in the project. Existing versus proposed plans with varying degrees of build out.